Okay. Here’s what happened: Fifteen years ago I had a dream. There was no mountain top involved, just me hanging out with Pablo Picasso in his studio. At one point in our conversation, Pablo lifted his cup of coffee to his lips, sipped quietly, and then said, “Art is a leap into the dark.” When I awoke, I thought to myself, that’s cool. I must have read that quote somewhere, though I didn’t know where. 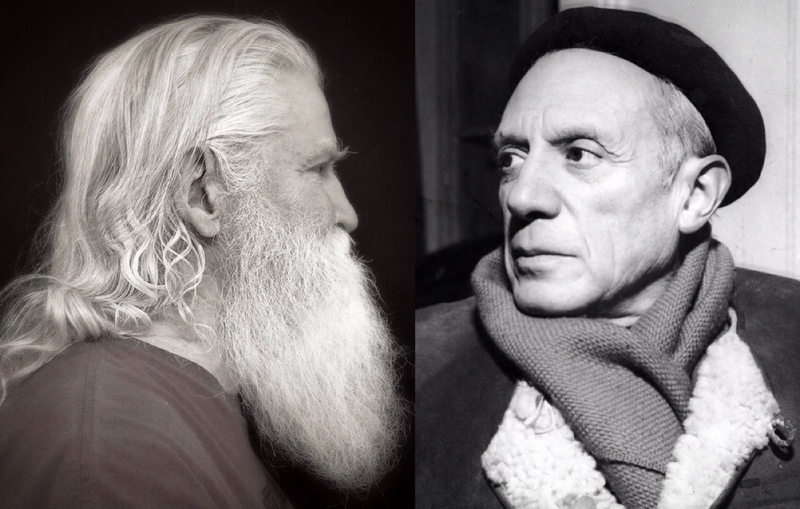 It ended up being used in my artist’s statement on my website – attributed, of course, to Picasso. I liked it so much, in fact, I even drew it on the wall and floor of my studio. Jump ahead ten years. I receive an email from a university student who was writing her thesis on Pablo Picasso. She had come across the quote on my website and wanted to use it, but she had not found the quote listed anywhere else, and she needed to know my source. Evidently, it had not turned up in any online searches or in any of the printed material she had read on Picasso. Hmmm. Had I put words into the virtual mouth of Pablo? And if that were the case, was not the quote actually by me? So, I began my own online research and, sure enough, the only appearance of the quote was on my website and in two quote databases, both of which listed my website as the source. On the strength of the sort of overwhelming evidence in favor of my inadvertent authorship via dream script, I began taking credit for the wise words. Jump ahead another five years. A Google search this evening turned up many listings of the quote, mostly attributed to Picasso, but there were a few attributed to me. What to do? Do I surrender authorship to the more famous of the two of us? Do I continue to claim authorship based on the dream and the seeming evidence that it first appeared in my artist’s statement? Or do I share authorship with a nod to the generally accepted notion that “great minds think alike”? Hmmm. I guess until I get that letter from Paloma’s attorney, I’ll keeping saying, “Art is a leap into the dark.” – Yow!